A young woman in 1513 struggles to survive when the Spanish Inquisition reaches her hometown of Granada in Cotton’s (Barbarossa's Barb, 2017) Renaissance romance. Seventeen-year-old Eva de Pazia’s life is full of secrets. Her father, Iago, tells her that her extra toe, a birth defect, proves her mother’s adultery with the devil; years of his abuse have left Eva terrified of men and marriage. Her closest companions in her unhappy home are her older brother, Elias, and her polydactyl cat, Tabita. A devout Christian who longs to enter a convent, Eva discovers that her once-Jewish father’s conversion wasn’t sincere. 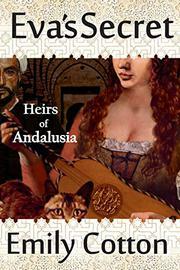 When the Inquisition comes to town, Eva turns her father in, believing that he’ll only be fined and exposed; instead, the Inquisitors seize her family’s home and assets, burn her father at the stake, accuse her brother of witchcraft, and give Eva to Moorish merchant Baltasar Cerra. Cerra forces her to live with his majordomo, the smallpox-scarred Baseel Alcazar, as his mistress—but Baseel never touches her. Instead, the two begin an uneasy friendship, playing music together on their guitarras and discussing religion; as Eva schemes to escape, she realizes that she may be falling in love. Cotton’s book is rich in detail, full of the food, furnishings, fashions, and faiths of the multiethnic milieu of 16th-century Granada, where many Christian “converts” continued to practice Judaism or Islam behind closed doors. The narration occasionally shifts to Tabita’s point of view, and its feline musings provide an often funny perspective on events—it’s sure that producing a “human kitten” will cheer Eva up, for instance, and it’s often confused by its mistress’s lack of interest in men. The frequent flashbacks are framed by sometimes-creaky segues: “She remembered the day she had been given Tabita—a day she would never forget”; “Eva was pulled back into the present.” For the most part, however, Eva’s plight and inner torment are compelling as she learns the truth about her family, herself, and her world. An ambitious, touching tale of a Granadian’s cruel coming-of-age.